Wang Lijun, the ex-police chief at the heart of China’s biggest political scandal in years, has been sentenced to 15 years in jail. Wang Lijun was jailed for ”bending the law for selfish ends, defection, abuse of power and bribetaking”, Xinhua said. His flight in February to a US consulate led to the downfall of his ex-boss, top politician Bo Xilai. Bo Xilai’s wife, Gu Kailai, was convicted in August of killing British businessman Neil Heywood. Wang Lijun was accused of helping in a cover-up. Wang Lijun – the former chief of police in the city of Chongqing, where Bo Xilai was Communist Party leader – had faced up to 20 years in jail, but prosecutors called his co-operation “meritorious service”. The ”combined term” of 15 years in prison included nine years for bribery, seven for bending the law, two for defection and two for abuse of power, state television reported. ”We decided to sentence him to 15 years altogether on all the four charges and deprive [him of] his political rights for one year,” court spokesman Yang Yuquan told reporters. ”Wang Lijun said he wouldn’t appeal after hearing the verdict,” Yang Yuquan said. The verdict was ”in accordance with the law”, he added, saying three of Wang Lijun’s relatives were at the hearing. Wang’s lawyer, Wang Yuncai, also told the Associated Press that the sentence was ”considered normal” under Chinese law. The verdict comes as China prepares to select new leaders in coming weeks. It is due to hold a party congress that will see major changes in the top echelons of leadership, although specific dates have not been announced. Wang’s trial took place last week in Chengdu. A court official said after the two-day hearing that he had not contested the charges. The indictment against Wang said he knew that Gu Kailai was a murder suspect. Wang Lijun, however, ”bent the law” by appointing Guo Weiguo – the deputy chief of Chongqing’s Public Security Bureau and ”a close friend” of both Wang and Gu – to oversee the case , a Xinhua report said. Wang Lijun hid a recording of Gu Kailai’s account of the killing from the police, the report added. But conflict arose between Wang Lijun and Gu Kailai, after which Wang told investigators to ”re-collect, sort through and carefully keep the evidence” from the case, the report said. During his term in Chongqing Wang had also committed other offences, including illegally releasing four suspects in return for property and money totaling more than 3 million yuan ($476,000), Xinhua said. 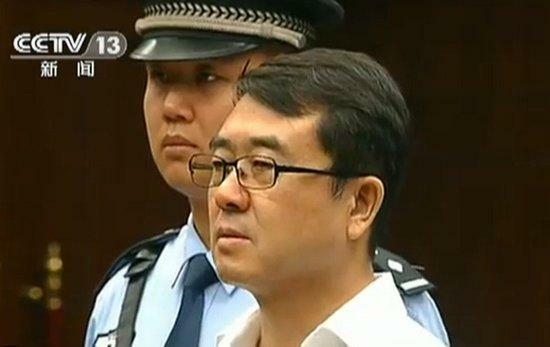 Gu Kailai was given a suspended death sentence for the crime. At a separate trial on 10 August, four senior police officers from Chongqing admitted covering up evidence linking her to the murder and were jailed for between five and 11 years. Bo Xilai has not been seen in public since the scandal erupted and is said to be under investigation by the Communist party’s disciplinary officials. He has been removed from his official posts. But it is not known whether the former party chief – who was tipped for promotion to the top ranks before his downfall – will face criminal charges himself. At Wang Lijun’s trial last week, Bo Xilai was said to have reacted with anger when the police chief told him of his wife’s involvement in the murder of Neil Heywood, “boxing the ears” of his former ally. Bo Xilai’s populist brand of politics – an authoritarian crackdown on corruption coupled with the promotion of old communist values – is said to have made him enemies. They may be pushing for a criminal trial that removes him from the political landscape for a very long time.